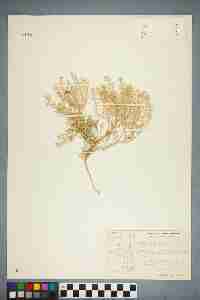 Annuals, biennials, or perennials; (cespitose or not, woody or not at base); glabrous or pubescent. Stems simple to several from base, erect to ascending, often branched (several) distally, 0.4-5(-7) dm. Basal leaves rosulate or not; petiole (0.5-)1.2-5.3(-7.6) cm; blade 1- or 2-pinnatifid to pinnatisect, or, rarely, undivided, (0.8-)1.5-4(-6) cm, margins (of lobes) entire or dentate. Cauline leaves shortly petiolate; blade similar to basal, or undivided and linear, smaller distally, base cuneate to attenuate, not auriculate. Racemes often much-elongated in fruit; rachis usually puberulent, rarely glabrous, trichomes straight or curved, cylindrical. Fruiting pedicels divaricate to horizontal, slightly recurved or somewhat sigmoid, (terete), (2.7-)3.3-8.5(-10) × 0.2-0.3 mm, sparsely to densely puberulent adaxially. Flowers: sepals oblong to broadly ovate, 1.2-1.8(-2.1) × 0.8-1.2 mm; petals white, spatulate to oblanceolate, 2.2-3.7(-4.3) × 1.3-1.8 mm, claw 1-1.4 mm; stamens 6; filaments 1.4-2.2 mm, (glabrous); anthers 0.4-0.5 mm. Fruits usually ovate to suborbicular, rarely oblong, 2-4.3(-5) × (1.5-)1.8-3.6(-4) mm, apically winged, apical notch 0.1-0.3 mm deep; valves thin, smooth, not veined, usually glabrous, rarely puberulent; style obsolete 0.2-0.7(-0.9) mm, usually exserted beyond, rarely subequaling, apical notch. Seeds oblong, 1.2-1.8 × 0.7-1 mm. 2n = 32. Flowering Apr-Aug. Pinyon-juniper woodlands, sagebrush and other shrub communities, rocky hillsides and crevices, bajadas, spring seepages, washes, gypseous grounds, sandstone cliffs, limestone gravel, playas, knolls, gumbo hills, sandy areas, alkaline flats and lowlands, roadsides; 1200-2700 m; Ariz., Calif., Colo., Idaho, Mich., Mont., Nev., N.Mex., Oreg., Utah, Wyo. 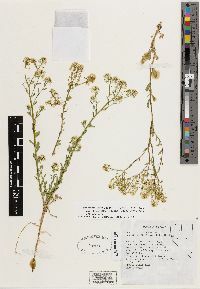 There is little agreement among North American authors as to the characters emphasized, the number of infraspecific taxa, their ranks, and their synonymies in treatments of Lepidium montanum. C. L. Hitchcock (1936) divided the species into 13 varieties and two forms, and later (Hitchcock 1950) further expanded its limits to include 15 subspecies and two varieties. His circumscription was so broad that it involved at least eight taxa accepted as different species by R. C. Rollins (1993), N. H. Holmgren (2005b), and us. 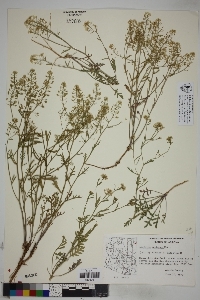 These include L. alyssoides, L. barnebyanum, L. crenatum, L. davisii, L. eastwoodiae, L. integrifolium, L. montanum, and L. papilliferum. 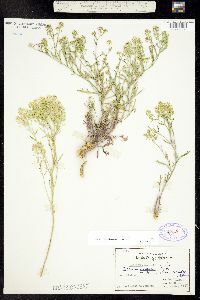 Although the recognition of seven of Hitchcock´s infraspecific taxa as distinct species helped somewhat in reducing heterogeneity in Lepidium montanum, this species complex remains far from being adequately treated in recent monographic (R. C. Rollins 1993) or floristic (N. H. Holmgren 2005b) works. In all, 12 varieties remain accepted in the species, and these only partially cover its overall complexity. The characters that various authors emphasized in the delimitation of infraspecific taxa include duration, habit, plant height, indumentum density, division of basal and cauline leaves, leaf shape, and fruit size. Indeed, the species is so highly variable in all of these aspects that the overall number of forms is mind boggling. Holmgren´s assessment that there are intermediates between the various varieties, even in areas where they do not overlap, is correct. The species is badly in need of thorough biosystematic and molecular studies to determine the number and range of infraspecific taxa, to discern the patterns of variation, and to determine how distinct the species is from the seven segregates mentioned in the previous paragraph. 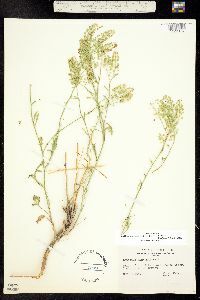 Duration: Perennial Nativity: Native Lifeform: Forb/Herb General: Annual, biennial, or perennial herb, 4-70 cm tall, from a taproot and sometimes a woody base; stems usually several, erect to ascending, often branched above the base; herbage glabrous or pubescent; plants with pungent, watery sap. Leaves: Basal leaves forming distinct rosettes or not, early-withering or not, on petioles 1-7 cm long; stem leaves alternate, sessile or short-petiolate; blades 1-6 cm long, once or twice-pinnatifid to pinnatisect, rarely undivided; lobe margins entire or dentate. Flowers: Small and white, in terminal racemes that are congested in flower and much-elongated in fruit; sepals 4, oblong to broadly ovate, 1-2 mm long; petals 4 in a cross formation, spatulate, 2-4 mm long, white. Fruits: Seed pods ovate to suborbicular, rarely oblong, 2-5 mm long and 2-4 mm wide, with a small notch at the tip and a persistent style that sticks out of the notch; seeds oblong, 1-2 mm long. Ecology: Found in pinyon-juniper woodlands, sagebrush and other shrub communities, rocky hillsides and crevices, bajadas, spring seepages, washes, gypseous grounds, sandstone cliffs, limestone gravel, playas, knolls, gumbo hills, sandy areas, alkaline flats and lo Distribution: CA, NV, AZ, NM, CO, UT, WY, MT, ID, OR, MI Notes: Lepidium is a genus in the mustard family with distinctive small, round, flat seed pods and small white flowers. 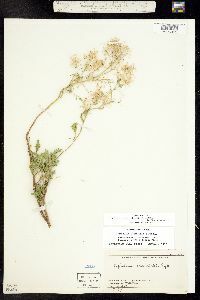 L. montanum is an absurdly variable species which over the years has been divided into a dozen or so subspecies, none of which are recognized by the Flora of North America (2010). It can be annual, biennial or perennial with a woody base. 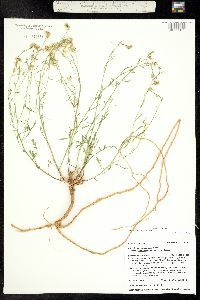 When perennial, it appears similar to L. alyssoides; distinguish based on the stem leaves, which are usually distinctly pinnately lobed in L. montanum but usually narrow and entire or with a few shallow teeth in L. alyssoides. When annual/biennial, L. montanum can resemble L. lasiocarpum, but that species is distinguished by its flattened fruiting pedicels (use your hand lens). Also note that L. montanum has 6 stamens in each flower-- four long stamens and two which are much shorter. This sets the species apart from quite a few other Lepidiums which have only 2 stamens in each flower, including L. virginicum, L. densiflorum, and L. lasiocarpum. Ethnobotany: Plant used to treat biliousness and gastro-intestinal disorders, palpitations, and dizziness; used as sheep and horse feed; and the seeds were eaten. 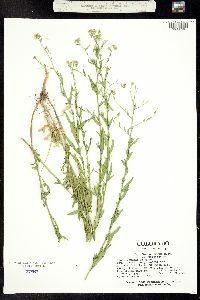 Editor: LCrumbacher2012, AHazelton 2017 Etymology: Lepidium comes from the Greek lepidion, meaning "a little scale," in reference to the flattened shape of the seed pods; montanum means of the mountains.